From “ Randwick to Hargicourt History 3rd Battalion AIF 1914-18 " By Captain Eric Wren. On the 17th August 1914, only days after the outbreak of World War One the author enlisted for service with the 3rd Battalion AIF. He quickly rose through the ranks and was present with the Battalion at its Gallipoli Landing on the 25th April 1915. The next day on the 26th April, the 3rd Battalion was heavily involved in the defense of Anzac against Turkish attacks. Eric Wren was wounded when a bullet passed through his neck exiting very close to his spine. After Hospital treatment, he returned to the trenches in time for the 3rd Battalion’s famous charge at Lone Pine on the 6th August 1915. The 3rd Battalion was the second unit to charge at Lone Pine after the initial attack carried out by the 4th Battalion. A 3rd Battalion Hero of that charge was Captain Howell-Price who was awarded the Military Cross Medal for conspicuous gallantry at the Battle of Lone Pine. Howell-Price had shown the greatest bravery in leading the attack. Frequently rallying the men while under heavy fire… he had killed three Turks with his own hands. 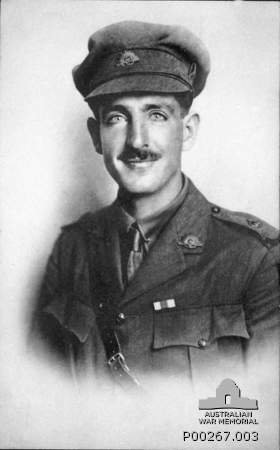 Captain Owen Howell-Price, survived the Battle of Lone Pine, he was latter to become one the youngest Lieutenant Colonels in the British/Allied Army. 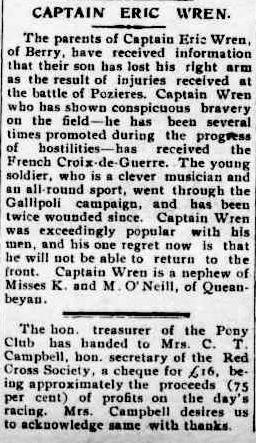 He went on to command the 3rd Battalion AIF before succumbing to wounds received on 4th November 1916 while visiting the front line near Flers France. He was only 26 years of age and is buried at Heilly Station Cemetery, Mericourt-L'Abbe, France. His family had suffered during the war with 3 sons being killed in action. The Battalion had lost 75% of its members during the three days' fighting at Lone Pine. Only six officers out of 27 were not casualties, and 277 other ranks out of 856. After Gallipoli the Battalion’s next major Battle was at Pozieres France in late July 1916. The Battalion took part in the first attack on the town of Pozieres. The author Eric Wren, then a Captain commanding “C” Company was wounded in the right arm. The next day on the 24th July 1916, his wound turned gangrene necessitating the amputation of his arm. 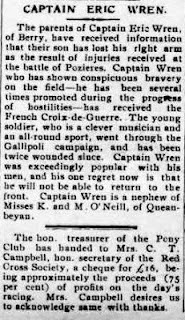 He had shown conspicuous bravery on the Pozieres Battlefield being awarded the French Croix-de-Guerre and had been wounded on 3 occasions. In a letter to his parents he said,”his one regret now is that he will not be able to return to the front”. After an appointment to a training Battalion in England, he was deemed unfit for duty and returned to Australia in late 1917. After the war, he resumed his clerical duties with the NSW Railways, he remained a stalwart of the 3rd Battalion and Limbless Soldiers Associations, being appointed the 3rd Battalion AIF Association Honorary Historian during the early 1930’s. He died at Melbourne's Caulfield Military Hospital in June 1941 aged 52. He had written his history of the battalion under the title of "From Randwick to Hargicourt". The title referenced from the 3rd Battalion’s first assembly at Randwick racecourse in Sydney NSW 1914 to its final retirement, from the fighting after the Battle at Hargicourt. In between, Wren covers all the 3rd Battalion battles, Gallipoli, 2nd Bullecourt, Ypres, Passchendaele, and the Hindenburg Line but also has collected digger stories of battalion life. Maps complement the text, and the pictures are clearly annotated. Appendices, unit nominal roll (with details of fatal casualties), Honours and awards(with many entries accompanied by a photograph of the recipient), and notes on Battle Honours complete this valuable history. Captain Eric Wren had first released his Battalion History for the 1935 Anzac Day likewise this reprint is released for the 2013 Anzac Day. Click to see details 3rd Battalion Military History Book. Have just found your post about Capt Wren, my research is with his wife's family, it is quite amazing.